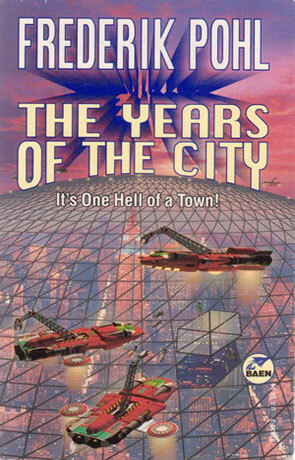 The Years of the City is a science fiction novel by Frederik Pohl. Subtitled A Chronicle of New York in the next Century, this book is about actually not as much about the big city as about the people in it and how they interact or rather doesn't. The book is split in to five different stories telling the story behind the larger and more visible changes to the city. Each of the stories is told from the point of view of a "normal" person, who may or may not be directly related to the change of the city. I found most of the stories dark and depressing – if this is the way, it's gonna go with NY in the next century, then I'm very happy that I'm not living there (not that I harbour any hope that, in it's own small way, Copenhagen isn't the same). The stories are more about politics and people, than technology, which is kind of surprising coming from Pohl. Written on 1st February 2000 by TC.